Life Magazine Classic Photo of Pablo Picasso. The picture was shot by photographer Gjon Mili in Vallauris, France in 1949. 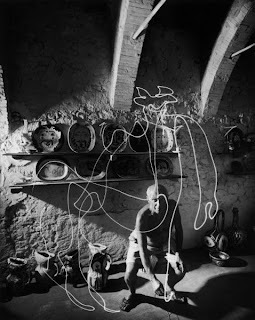 The photo shows us Picasso in a different but interesting and original setting. 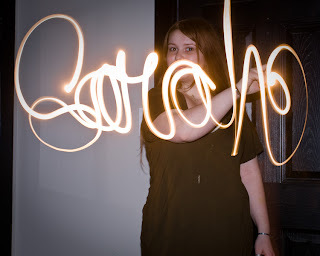 My daughter, Sarah, painting with a small flashlight. This fun little idea can have some very interesting real world applications. Of course, you have to learn to write your name backwards! When you think of "Painting with Light" you might think of spreading a light beam ONTO an otherwise dark subject. But, if you let the actual light do the story telling, the results can create a new perspective. This is a simple technique using the "Rear or Second-Curtain Sync" setting on your flash or as a custom function in your camera if using an older flash. Second-Curtain Sync forces the flash to fire at the end of the exposure rather than at the beginning. In a dark environment, use a tripod and select a long Shutter Priority, or "Bulb", exposure to create a dramatic effect. Imagine the many subjects that could be enhanced with this technique. Perhaps a Stallion in a semi-darkened arena with a few light trails right before the flash, a bride on the dance floor showing some movement right before the image is frozen, a stage production. Use your imagination, and your camera settings, to put your vision in a new perspective. Share your interesting "Light Techniques" here.